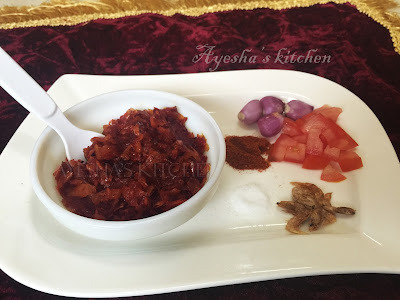 Heat a pan and fry the dried prawns (unakka chelli) until done in a medium flame. Using a mixer, reduce the dried prawns to powder. Keep it aside. Now take deep bottomed vessel and heat oil. Saute the sliced small onions very well until dark brown and then add chopped tomato. Add the chili powder or the crushed dried chili along with the tomato with required salt and cook well till it becomes a fine paste. Cook for few minutes. Saute occasionally. Pour some coconut oil on the top.